Does your pint support ethnic cleansing? A subsidiary of global Japanese beer brand Kirin donated to the Myanmar army during its ethnic cleansing campaign against the Rohingya people, our evidence suggests. Kirin’s subsidiary company, Myanmar Brewery, made three donations amounting to $30,000 between 1 September and 3 October 2017. 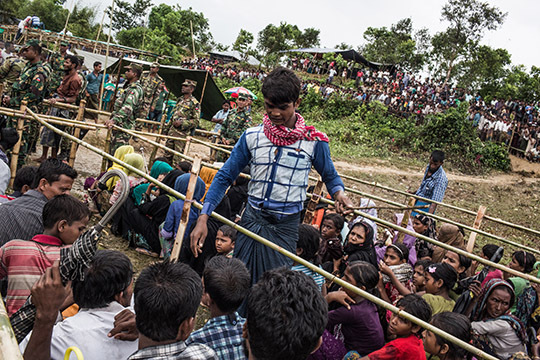 At this time the Myanmar army were violently attacking the Rohingya people, eventually forcing more than 702,000 men, women and children to flee into neighbouring Bangladesh, where they remain to this day. We documented numerous crimes against humanity amid the violence, which included killings, rapes, torture, village burning and forced starvation tactics. The first donation was made to the Commander-in Chief of Myanmar’s army, Senior General Min Aung Hlaing, at a televised ceremony in the capital Nay Pyi Taw on 1 September 2017, according to the General’s Facebook page. Kirin is a major international brewer which, along with its own brands, also owns the Lion beverage company in Australia and New Zealand, and a 48.6% stake in San Miguel, of the Philippines. In 2015 Kirin bought a 55% stake in Myanmar Brewery, the country’s largest beer maker, for $560 million. The remaining 45% is held by a powerful conglomerate owned by members of the Myanmar military called the Union of Myanmar Economic Holdings Limited (UMEHL). On 29 August 2017 the Myanmar government gave Kirin clearance to invest a further $4.3 million for a 51% stake in Mandalay Brewery, in a separate joint venture with UMEHL. Through these investments, Kirin says it controls 80% of Myanmar’s growing beer market. Kirin say that Myanmar Brewery ‘has never made donations with the intent of supporting military operations in Rakhine State or anywhere else, either directly or through UMEHL’. But this is not supported by public evidence. Kirin initially told us that the three donations were made to the Rakhine State government in response to a request for humanitarian relief for victims of the violence. Kirin later stated that two of them were handed over directly to victims. But the assertion that the donations were not made to the military are contradicted by a Facebook post made by Senior General Min Aung Hlaing. This stated that the payment was going in part towards 'security personnel and state service personnel', operating in Rakhine State. Kirin also stated that under the terms of its partnership with UMEHL there is a clause ‘that explicitly prohibits the use of Myanmar Brewery funds for military purposes.’ But Kirin gave us no evidence that they checked, and said that the exact terms of their agreement are confidential. Finally, Kirin told us that the donations were sent directly to a bank account owned by the Rakhine State government. But they again provided no evidence, and admitted they couldn’t account for how the money was spent. It is extremely worrying that the company could not account for where these funds ended up. Whether donating to the military or the Rakhine State authorities, Myanmar Brewery has risked worsening the human rights situation for the Rohingya. Even if the donations were made to Rakhine State government rather than the military it would still raise serious human rights concerns. We have found those authorities responsible for creating and maintaining a longstanding state of apartheid for Rohingya — a crime against humanity. Kirin’s responsibility to respect human rights, wherever they operate, is clear from the United Nations Guiding Principles on Business and Human Rights. To do so, companies must make sure their business activities do not cause or contribute to human rights abuses, and they must properly assess the risks involved. Kirin admits it has not done this. Through its donations to the authorities, as well as appearing to endorse the military’s actions in Rakhine State, it has put the human rights of Rohingya people at further risk. Kirin created a new global human rights policy in February 2018 and have told us that they will prioritise a review of Myanmar Brewery’s dealings in the country. It has also announced the suspension of all donations. But any potential damage has likely already been done. We are in no way calling for businesses to boycott Myanmar – nor are we against foreign investment in the country – but we do call on Kirin, and all companies, to act responsibly and to be transparent in the steps they take to avoid causing human rights issues. We also call on Japan to investigate these payments. All countries must make sure their corporations doing business in Myanmar do not cause or contribute to human rights abuses.